Many of the difficulties encountered when learning the bass can stem from not properly holding the instrument. Be it tilting the bass down, resting the bass in the wrong place, or any of the other many mistakes you can easily make when learning to play, you will want to know what to look for so you can catch yourself and avoid the common problems. The fingers that fly across the fretbaord get all the attention and glory. But for the bass player, much of our musical expression comes from the 'other hand'. 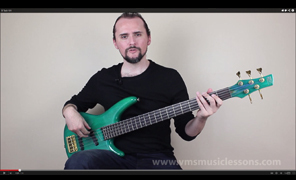 Learning a proper way to approach the finger plucking of the bass is the best way to ensure that you will be able to capitalize on all the percussive power the bass has to offer. If you've ever been lost, you know how helpful directions can be. If you're lost trying to learn a song, some of the directions are easy enough to understand: use this finger on such and such fret of this string. But when it comes to timing and rhythm, the directions are not so clear. Free yourself from the often error-prone practice of trying to duplicate rhythm by ear by starting to learn how to understand rhythmical directions. No song you are ever going to play will have you stay on one note for the entire song. Instead, you'll be required to not only change from one note to another many times throughout a song, but you will also have very specific times at which it do it. This lesson introduces you to the process of coordinating notes and beats to create legitimate bass lines.